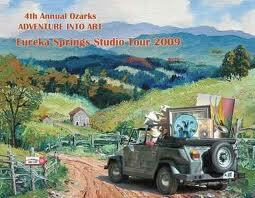 Enjoy the beautiful fall scenery as you adventure into art with the Eureka Springs Studio Tour. Discovering the creative side of Eureka Springs is as easy as walking through the quaint city streets but you can plan an adventure into art with the Eureka Springs Studio Tour. This free, self guided tour is a great way to explore Eureka Springs and discover why it is recognized as a Top 25 Art Destination in the nation. Beautiful fall scenery will inspire you as you travel to the studios where art is being made everyday. Attend an art demonstration, meet artists, see a side of Eureka Springs that local artists see. After an inspiring day in the studios, enjoy culinary art at one of Eureka Springs restaurants. Find art that speaks to you in one of Eureka Springs art galleries or unique shops. Relax as evening arrives with free music in Basin Spring Park. 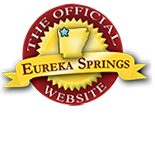 Eureka Springs Studio Tour is typically held in the month September and coincides with Jazz Weekend. This entry was posted on August 22, 2012 by estcblog in Arts & Culture, Festivals, Road trips, Shopping, Things to Do and tagged Arkansas, art galleries, Eureka Springs, local culture, Top 25 Arts Destination.